Located In The Heart Of Historic Downtown Keyport In The Turn Of The Century Brick Building Near The Bay, McDonagh's Pub Combines Old-World Charm With Modern, Hip Cuisine. We Offer An Amazing Menu Of Irish Fare, Bistro-Style Salads, Homemade Soups, Signature Sandwiches, Wraps, Thin Crust Pizza, Fabulous Fish & Chips. A large selection of beers and lagers from around the world. Enjoy Acoustic Tunes On Thursdays And Live Local Bands On The Weekends Playing Everything From Irish Folk To Rock & Roll. 20 Large Screen TV's Are Always Showing The Biggest Games! RATED TOP 25 BEST BURGERS AT THE SHORE! 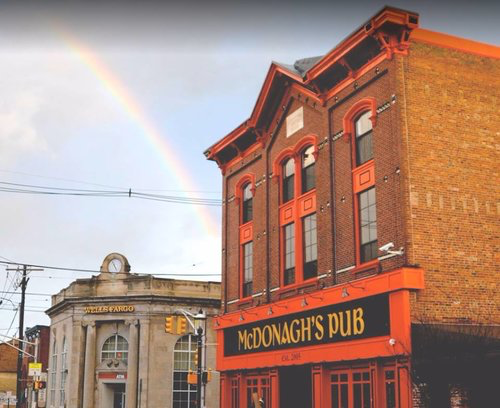 McDonagh’s Pub Is Located In A Beautiful Exposed-Brick Building That Is In The Heart Of Keyport. Not Only Do We Have A Warm And Charming Dining Area, We Have A Newly Constructed 3000sq Foot Patio That Would Be The Perfect Place For Your Next Event. Whether Your Hosting A Bridal Shower, Birthday Party, Graduation, Or Business Dinner, Our Hospitality Team Will Make Sure Your Event Is Planned Perfectly To The Smallest Detail. Amazing Menu Options, Open Bar, Wine & Beverage Packages, And More Are Available. Call Us Today To Inquire About Having Your Next Event At The Pub.